Discussion in 'Thredbo' started by andrew6736, May 23, 2006. Wonderful @Diponza will see if I can do it. Have done a brief presentation at History House and it is well worth attending just to see the place! Really lovely building. Enjoyed the talk Diponza. And how cool was it having Laurie Seaman Junior presenting his father's skis to the Threbo and Perisher Historical Societies. Agreed! great to put a face to the name too Angus and Diponza. Thanks for coming down and being a part of it. I'm absolutely delighted that everyone enjoyed the story. It was a great night. These comments on the Charlottes Pass to Crackenback lift are fascinating. My father, George Grainger Buckworth was the founder, Chairman and Managing Director of Broken Hill Holdings Limited which traded on the ASX. BH Holdings founded and owned Kosciusko Chalet Pty Ltd. George let me out of school to ride the chairlift and ski all the trails. As an 11 year old it was the thrill of a lifetime. In 1964 the press in Sydney were giving George a hard time about the Chalet, saying that he was snow blind and that the lift did not even exist. To put paid to this George put his 76 year old mother on the lift at Crackenback and she rode it all the way to Charlottes Pass. He then convened a press conference in Sydney and proceeded to show the movie of his mother riding the lift. Thank you everyone for your reminiscences and comments. George died in 2009. Google SMH to see his obit and the mention of the Chalet. TC, Ken Oath, i_am_higher and 4 others like this. Would there be any stills from that movie? Thanks, so much, for getting in touch. As you may have read, this topic has been bantered around these forums for years ...and many theories have been expounded on the history of the ski lift. A few "tall tales" as well. The media certainly were not kind to your father. I'd say that rather than "snow blind" your father was a visionary ...of the ilk we no longer meet these days. 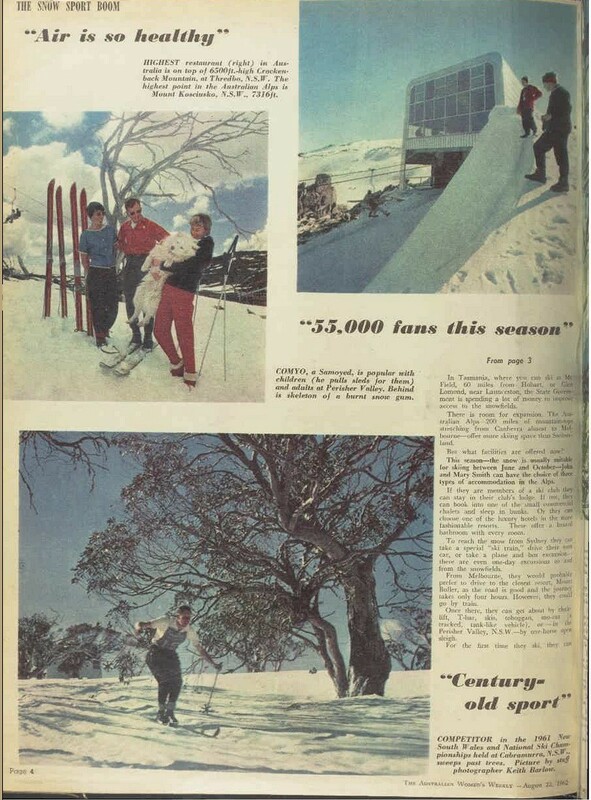 I'm sure all the members here would all agree that the pioneering spirit exhibited by your dad & his collaborators on the Charlotte Pass to Thredbo lift demands the respect of all ...snow sports enthusiasts as well as the general public. TC, Angus_McCrory and benchives like this. Nicholas, you should get in contact with @Diponza who is putting together what is to date the definitive histroy of the venture. Not a problem. You'll just have to come to my next talk on Saturday night and introduce yourself. That would be one @Bogong would be interested in. Hi guys. I think it was the time I've just spent on Trove correcting mistakes in the OCR scans of the papers on the back of a search for various terms related to this thread that got me to register. Anyway, just dropping this link here in case it is of interest or use to anyone wanting to look back through old articles. Note that my term used in the link is just one, I bet if the press were invited to that screening it would be in a paper somewhere as well. Do I hear a "Challenge accepted" from anyone? I had a ball reading and correcting this Article. Love all this history of the Snowies! This "ghost" chairlift is fascinating. 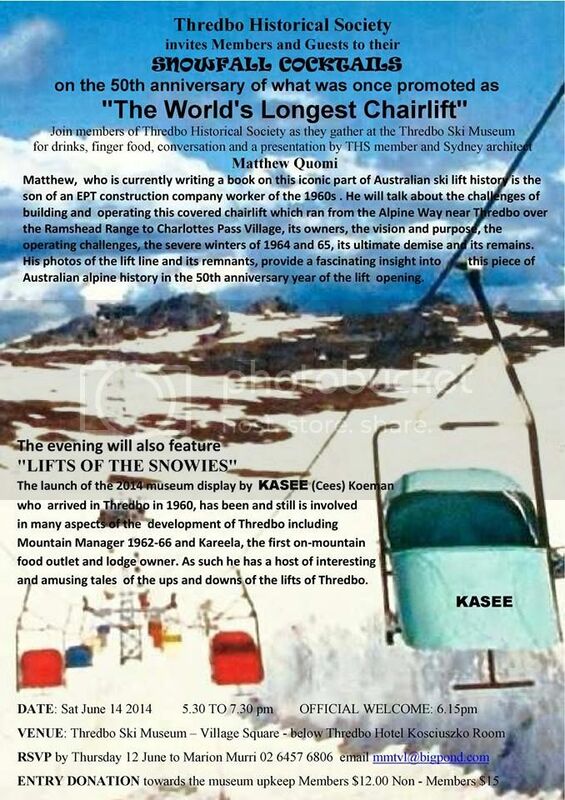 Pity I missed the Thredbo Historical Society movie night! Would enjoy seeing Mr G.G.Buckworth's (God bless his soul.) movie of the existence of the ghost-chairlift. It's not only a testimony to the pioneering spirit and our deep desire for the mountains but an inspiration toward the possible linking of the current resorts. Despite the challenges of distance and nature's intensity up over the Ramshead Range it's still possible to achieve. It seems this Ghost-chairlift may have crossed close to the tops of the Twin Valleys east of Thredbo I've heard are awesome ski slopes. (Oh-oh I hear a Greenies uprising). Makes me appreciate what we have today even though the tickets aren't cheap (we lack the population base here to lower prices I guess). Thanks for all the info! TC and VSG like this. I remember as a kid it was in the Guinness Book of Records as the longest chairlift in the world, even thought it wasn't running. Around 1980 would have been the publication. 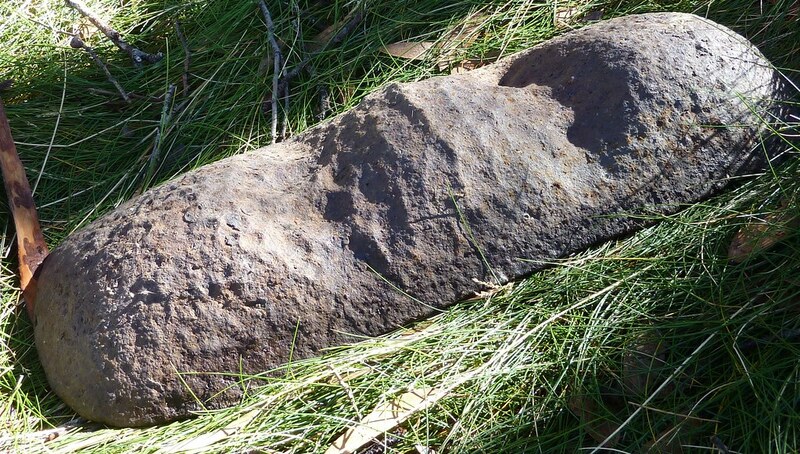 There's still heaps of evidence of the lift around Still well. Is that a yeti on skis in your pic? Seems as there exists some misinformation on the history of the lift. My understanding, from various books and internet discussion, was that the lift opened for operation at the beginning of the 1964 Ski season. The lift was allowed to open the next day and hundreds of skiers lined up to take their first aerial adventure from the Thredbo road to the Chalet at £1 per ride". I have heard and read pretty much the same date and details from others. Top of page, right corner. 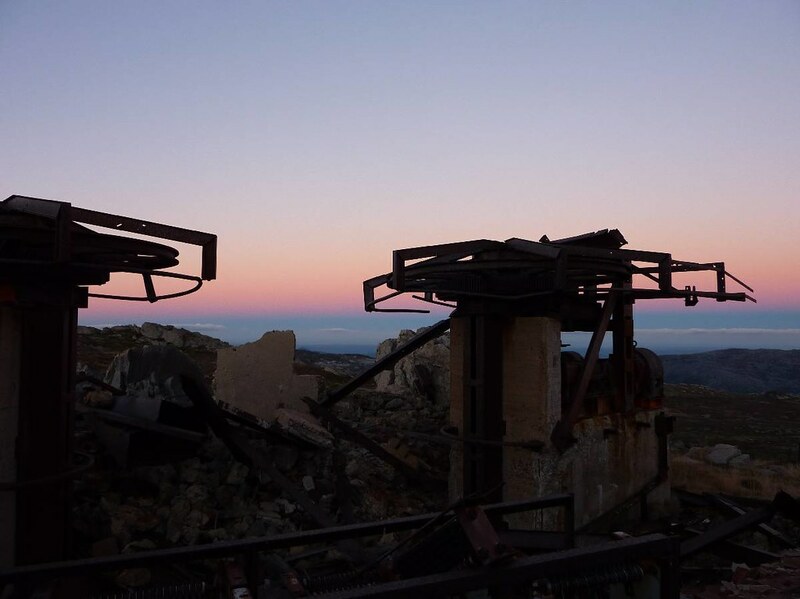 "Although the Department of Labour and Industry passed the chairlift as safe about four weeks ago, Kosciuszko State Park authorities had not given their approval until Saturday [ August 1] "
The owner of that blog does post here.... frequently. They were all taken from posts in here. Thought i would create an "archive " of sorts. Diponza and I walked up the lift line - this time starting from the point where the terminal was at the Cell Block at Charlotte Pass to the restaurant ruins, passing the sites where Main Range View Station and Wrights Creek Station. Instead of continuing down to the Alipne Way as we did in 2012, we headed around to the North and picked up Trapyard Creek to follow this back to Charlottes. Either Diponza or I will post a few of the photos we took along the route. You can still see the original lift cable in many spots along the way. Wildflowers this Summer are pretty spectacular too. One senior ranger says he's not seen anything like it for decades. cashey007, AJS and Whiteman like this. I camped near the Top Station Restaurant at night in Autumn 2014 and it was windy and freezing. Flapping tent all night and one hour sleep! My advice is seek the shelter below the treeline on the Thredbo Valley side. Autumn 2015 I walked up the opposite side to see the line of the Chairlift through the trees first hand. Regrowth after 2003 fires was awful and it took me 5 hours to get up to the peak. The view was worth it and there was plenty of Brumbies to see. I was happy to discover a scrap from a chair. cashey007, Diponza, Majikthise and 10 others like this. Another pic that you may like. When camping you have time to search for things. The 2003 fires missed this area and so preserved the remains. The coloured part is made of fibreglass. This is a mystery cast iron/steel item on the chairlift route (generally found broken with two bumps instead of three). Width 150mm, length is about 400. 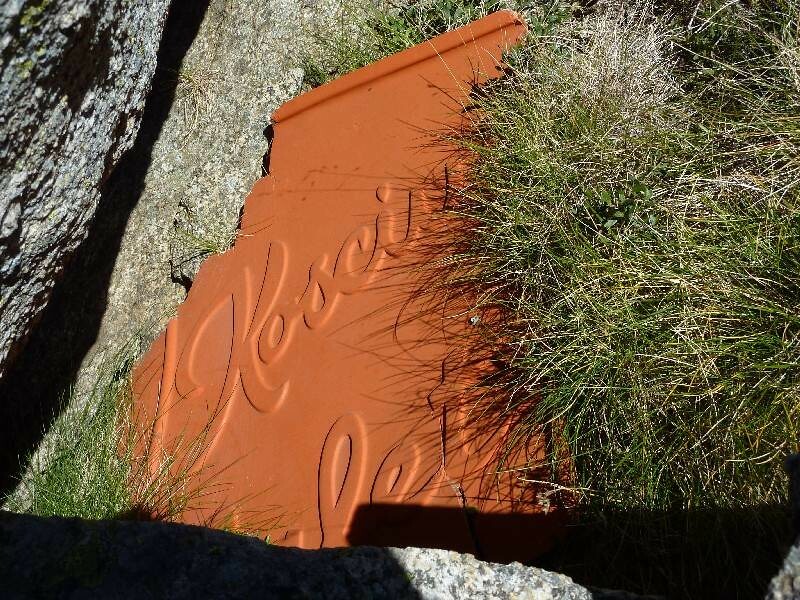 There are several discarded near the top station restaurant ruins & on the way down to the tree line. One suggestion (of an outsider) is that they were part of a portable rail track for moving construction items from one place to another. I imagine that they would use them like sleepers to space out two rails made from angle or something. TC, cashey007, AJS and 4 others like this. shouldn't that be saved and preserved as a piece of history. Boxen, that piece won't be around much longer if you reveal the location. Strongly suggest you get in touch with people at the Thredbo Ski Museum who may be able to retrieve it and keep it safe for posterity. cast iron bits not parts of the counterweight ? Would have been great lift in its day. Those lumps of sculptured steel were employed as counterweights in attempt to stop the chairs being picked up by the wind and derailing the cable. Unless someone has access to a helicopter, that chair will stay on the mountain because it's in a very remote place. It's also extremely heavy. The Thredbo Historical Society already has a chair in its museum which was donated by Rick Walkom. 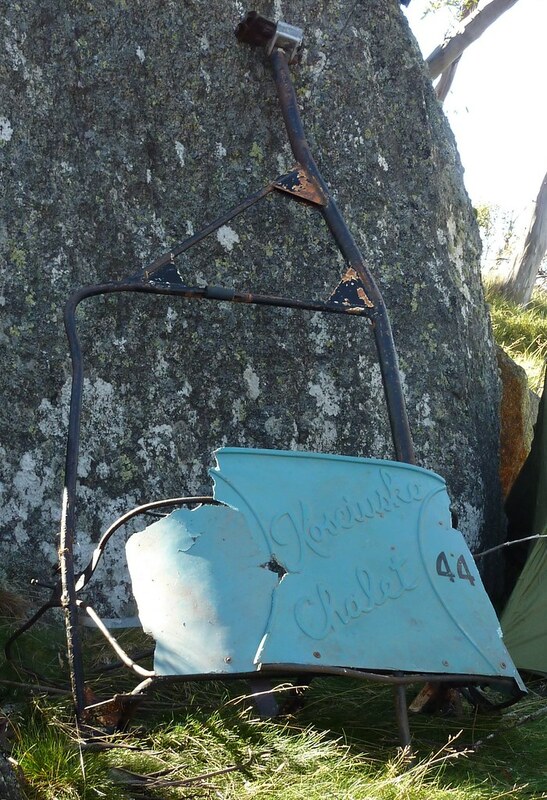 The Perisher Historical Society is also interested in adding a chair to their collection, with the idea for it to be a permanent exhibit by suspending it from the roof structure inside the Skitube building in Perisher. 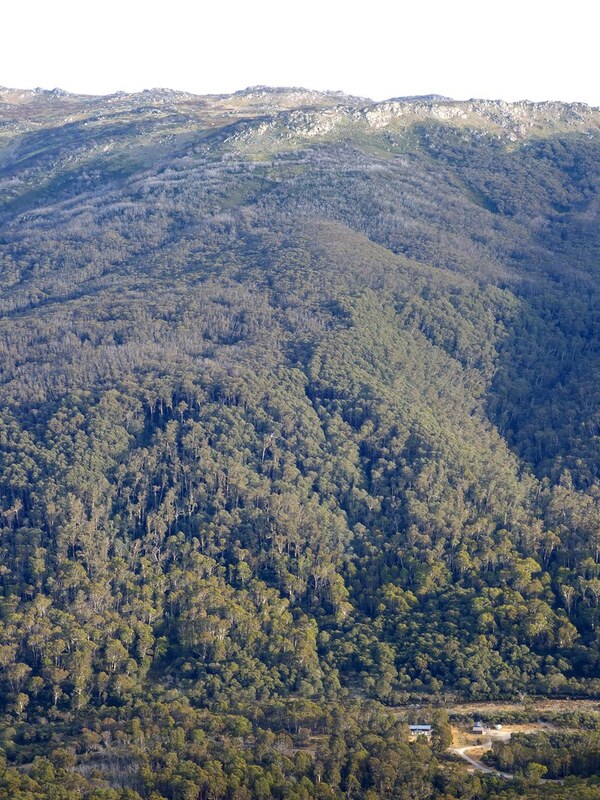 I'm really interested to walk the old lift route in a few weeks time (early December 2015) and after reading through, I will be heading off on my own, looking to start on the Thredbo side of the mountain and grab the Kossie lift up and then follow the plateaus to above the old ranger station and then traverse across. 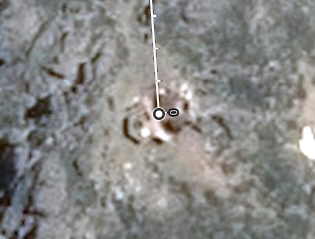 The actual lift outline is still shown on the Perisher Valley 1:25,000 map which is very handy. Would appreciate please, any additional advice feedback from those who have traversed and followed the lift line. Avoid the bit from the Thredbo River to the tree line. Below the tree line by all accounts is still painfully slow up or down. TC and cashey007 like this. If you want to stay on the lift line below the tree line you will need to employ a compass, checking the bearing every 50 metres or so. The tree canopy blocks the view of the horizon so losing your sense of direction is inevitable. The thickness of the vegetation also contributes to the difficulty of the walk, even while descending. I would only attempt to follow the lift line below the tree line with a reasonably high level of fitness because the constant wrestling with the scrub is extremely fatiguing. 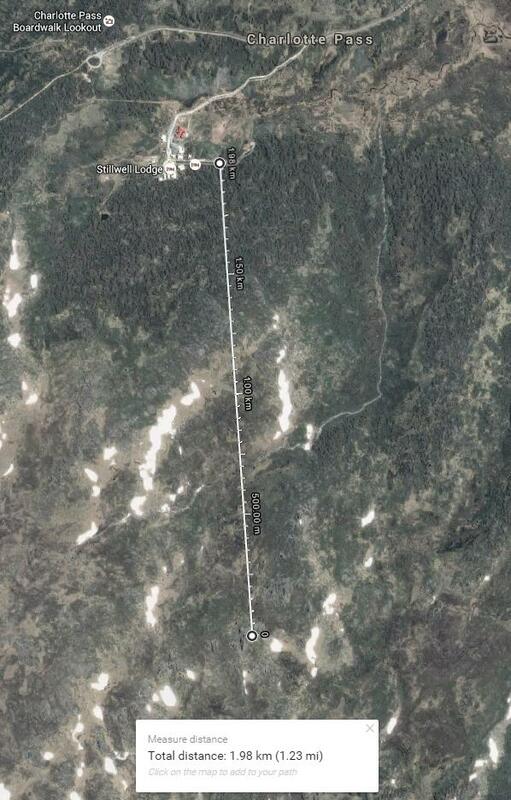 I absolutely hate to be that guy but has anyone plotted the lift line on a topographic map by chance? I'm considering doing a trip to CP to check out the remains but I'm a bit hesitant without a real good idea of where I should be looking for these things. I've gone through the entire thread and it looks like the images with the line plotted are all dead - I'm a bit late. General consensus seems to be to walk up the line from CP - is that right? Would it be a good idea to literally walk straight up the lift line from the village or go around the back then up (as in from Summit Rd-ish)? EDIT: Just found this a page back - http://www.potofgrass.com/albums/anon/back_of_charlottes_chairlift_1975_gearth_001.jpg - gives some idea of where things are but question still would stand - what's the best way to walk up from CP? !